Raised center aisle or Monitor horse barns are ideal for animal confinement. Proper horse barn design allows hay to be stored in the loft and pushed down into the stalls from above. Our horse barn kits with loft using Raised Center Aisle provides this option. Ventilation is one of the most important aspects of designing a horse barn to remove condensation build up and smell due to urination and breathing. Many times simply perforating the sidewall soffit isn't sufficient ventilation. 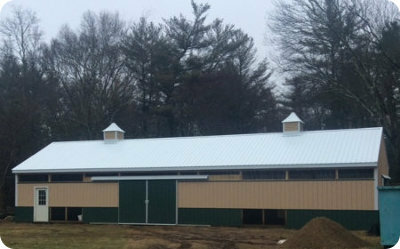 Cupolas and powered gable vents are used when a large number of horses are in a horse barn. 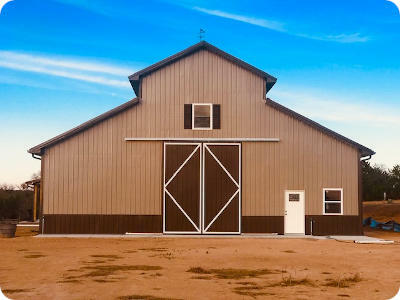 We offer instant online prices for horse barns, riding arenas, and other types of farm buildings. Please contact us if you need help customizing anything. There are many factors to consider when designing a horse barn. We recommend that your barn be oriented so prevailing breezes run the length of the barn. Opening sliding & dutch doors will keep things cool and fresh for your horses. Storing hay in the barn is convenient but can lead to breathing problems without sufficient air flow. Hay storage up top is ideal for this reason, as well as the convenience of easily dropping hay down into the stalls. A radiant barrier can repel heat created by the sun beating down on roofing and siding which will keep the building cooler during summer, and retain heat during the winter. If you need help configuring your horse barn we are here for you! Our selection of product and services include a full range of product needed for any type of animal confinement. 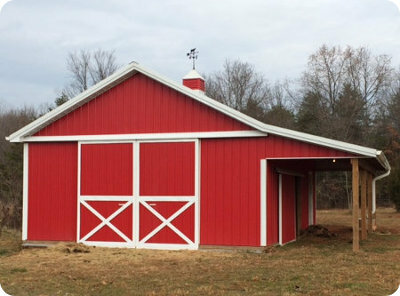 Our horse barn kits include premium quality material, delivered and unloaded on your jobsite. 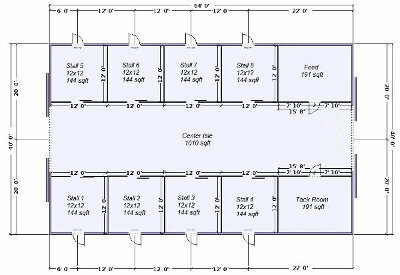 We include staging lists by wall and roof section for simple confirmation you received all the material needed as you break down the packages and stage the site for construction. Our plans are simple and precise blueprints that make construction a snap or anyone with carpentry experience. The ideal scenario for animal safety typically means sliding doors on both endwalls, especially if equestrian style windows are used in the event dutch doors aren't in the budget. Hay can self ignite if improperly stored, or stored in hot environments. Typically 130 degrees or less is optimum. A simple way to test hay temperature is to drive a 1/2" diameter metal rod into the hay and leave or 20 minutes. If you can hold the rod comfortably in your bare hand then temperature is ok. Any hotter is a warning sign. Fire retardant stain can be applied to hay storage areas, don't smoke around hay barns, maintain electrical properly, and control the environment with ventilation to reduce temperatures in hay storage areas.